Haven’t decided on a hotel yet? 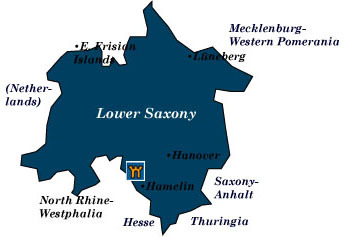 You can look at other available hotels in Lower Saxony region with Booking.com. Its scenery and attractions may not be as dramatic as other German states, but Lower Saxony can boast of moors and heaths and the noble Harz Mountains to the east, while lovers of history can transport themselves back several centuries to the era of charming Renaissance towns. If the small towns seem a little too bucolic, the independent Hanseatic cities of Hamburg and Bremen are just up the road. Goslar This enchanting town next to the Harz Mountains can boast of 1,800 half-timbered houses, the largest concentration in all of Germany. The town and the nearby Rammelsberger silver/copper/lead mine are now UNESCO World Heritage Sites. Goslar was also home for nearly 300 years to the Holy Roman emperors, as well as being a wealthy trading center during the Middle Ages. The town makes a perfect base for excursions into the Harz Mountains. Lüneburg Founded nearly 1,000 years ago, most of the buildings date from the 15th and 16th centuries when the town was at its most prosperous. Famed for its “white gold” or salt, the extraction of this precious substance over the centuries has caused its buildings to tilt and pavements to become crooked. The Deutsches Salzmuseum is devoted to the subject. The town is also the jumping off point for the Lüneburg Heath, a stunning, wind-swept land reserve, which is full of bird life and hiking and cycling trails. Celle Untouched by war, fifty wonderfully preserved half-timbered houses, further embellished with sage advice from the Bible, give this town a picture book appearance. Notable in town is the moated Renaissance castle of Herzogschloss. Once the palace of the dukes of Brunswick and Lüneburg, its baroque theater dates from the 17th century and is still in use. Hameln (Hamelin) If the story is true, the Pied Piper of Hamelin had gotten rid of the rats and happy children of this town, but the rats appear in every incarnation you can think of: toys, rat-shaped candy, bread, pastries, and lots of souvenirs. The children are real though and at least outwardly appear happy. You can’t lose your way in town—just follow the line of white rats on the pavement. Bodenwerder Hometown son, Baron Hieronymous von Münchhausen (1720-1797) put Bodenwerder on the map. Known for his over-the-top lies, his name now refers to a psychological affliction known as Münchhausen’s syndrome. The Münchhausen Museum is dedicated to his life and times. On its own, the town of Bodenwerder is quite charming and well worth a visit. Bergen-Belsen For a sobering experience take time to visit one of Germany’s more infamous concentration camps. None of its original structures remain, but the grassy mounds hold the mass graves of some 70,000 souls. It was here where Anne Frank finally died, and a gravestone has been erected as a memorial to her. Göttingen If you happen to be a Nobel prize winner, you’ll find plenty of company here. The Georg-August Universität has produced forty recipients of the prize. And let’s not forget the Brothers Grimm, explorer Alexander von Humboldt, and (as a student) Prussian chancellor Otto von Bismarck, who all spent time here. This is a town worthy of wandering about its center, soaking up the university atmosphere, and strolling beside its moats and ramparts. Hanover The state capital of Lower Saxony, Hanover deserves a stop off the autobahn. Much of what you see is reconstructed from the destruction of World War II, but it’s the Herrenhäuser Garten (Royal Gardens) that’s the special attraction. These baroque gardens, which are part of the former Hannoverian summer palace (the palace is long gone) is modeled on that of Versailles. Special features are fountains that shoot jets of water into the air, a maze, a moat, patterned walkways, chestnut trees, lawns and flower beds galore. In summer, concerts and plays are performed. The Sprengel Museum is a modern art museum that holds works by Picasso, Klee, Chagall, and Ernst. The museum’s special exhibitions are especially worth seeking out. Wolfenbüttel Here you’ll find 600 restored half-timbered houses to wander past. Presiding over the center of the town is a baroque schloss—the largest in Lower Saxony—once a residence of the Braunschweig-Lüneburg dukes. Jever If you’re en route to the East Frisian Islands, stop off in Jever to visit the town’s 14th-century schloss. With its distinctive onion-shaped dome, you’ll think you’ve missed a turn and are now in Russia (Jever was ruled at one time by Russia.) Be sure to try the town’s famed Pilsener, produced here since the mid-19th century. East Frisian Islands Long sandy beaches, sand dunes, and great open skies are the attractions on these seven islands—some of which delightfully forbid cars. The German aristocracy used to vacation here for centuries.